My French client visits our factory for looking a fine tin boxes factory Last Wednesday. Last Wednesday, My French client Ms. Muriel visited our factory for looking a tin boxes factory with the fine quanlity and strong system. Ms. Muriel knew our company from website: www.tinpak.com . 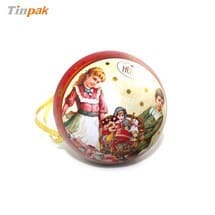 She found we have do a lot of tin boxes and we are a fine quality tin boxes manufacturer, then she desided to pay a vist to our factory. "Seeing is beliving. I must to check your quality by myself." Muriel said. She has 17 years experience on tin boxes and very familiar with them. We had a 4 hour meeting in our showroom. Ms. Muriel checked all the tins and she was very happy as she found us. We can do the tins in good quality. After meeting, She visited our facilities, the machines, the dust-free workshop , the tooling huse and so on. She was very satified with our company and she told me she will place the orders soon.